Preparing for CAT, or for that matter any competitive exam in India, is not an easy task. It takes a toll on your body and on your mind. And if you have a demanding job, it becomes all the more difficult. The amount of time that you have left with for CAT 2018 preparation is limited. There is no point denying the fact that once you are back from a 9 hour shift, your mind is tired as well. So, what can a working professional who aspires to get an admission into IIMs do? How should he prepare for CAT? How should he plan his studies so that he can use the limited time available to him in the best possible fashion? These are some of the questions that I will try to answer in this post. a) Study for at least 2 hours everyday (every working day). Ideal would be 3 to 4 hours. b) Study for at least 4 hours on Saturday and Sunday. Ideal would be close to 6 hours. You are still left with three slots for preparation. In the beginning of your preparation, these three slots should be allocated to the area that you are not confident in. Do note that CAT will ask easy and difficult questions from all areas. If you are weak in a particular area, you might miss out on a sitter from that area. That is a mistake that you cannot afford to make in the hyper competitive world of CAT preparation. If you are done with 50% of the syllabus, these three slots should be allocated towards giving mocks and analyzing those mocks. 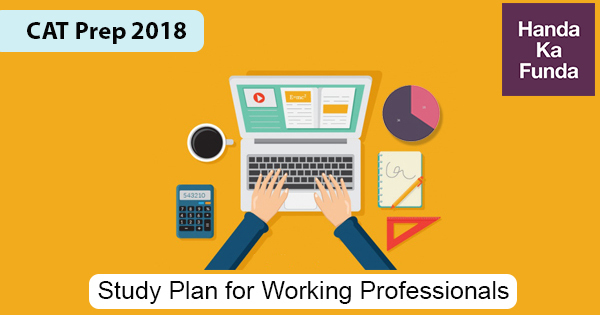 There cannot be a better way to find out the problems in your preparation plan than these mocks. If there are any specific areas that you are not comfortable in, you should focus your time and energy on those areas in the beginning of your CAT preparation. You should start with clearing your basics in the initial stage of your preparation. You will not have the time or the inclination to do this at a later date. So, it is best that you use this time to work on your basics. While this is valid for all parts of the CAT syllabus, it is specially relevant for Quantitative Aptitude and Verbal Ability. All the formulas and concepts that you need to understand, all the novels / books that you should read as a CAT aspirant, all the CAT Preparation videos you need to watch – all of that should ideally happen in this time period. Some questions in Data Interpretation require a lot of calculation, and this is the best time to improve on this aspect. Make sure that you practice some calculation intensive questions on a regular basis. While there are a few concepts that are involved in topics like Logical Reasoning, Data Interpretation, and Reading Comprehension – they are primarily dependent on practice. This is where a lot of students, specially working professionals, lose track of their preparation. They do not practice enough. The do a few questions / run through couple of chapters in a book and they think they are done – it is a huge mistake that you should avoid. You should try to practice as much as you can, specially in the areas that you are weak in. By the time you start the testing phase, you should be confident of solving easy questions on all topics. And the only way to get that confidence is to practice more and more questions. Try to identify your weak areas and work upon them. If you are looking for some books for CAT preparation that can help you practice, you can find the list here. There is a school of thought that believes that all you need to do well in CAT is mocks, mocks, and more mocks. I do agree with that sort of thinking but it is probably true for only a small set of students. If you have taken CAT before and scored a 95+ and you are trying again this year to improve your score – probably writing 50 mocks or writing 100 mocks is a good idea for you. But for everyone else, writing too many mocks will serve no purpose. The goal of a mock is to figure out your strong and weak areas. The goal of a mock is to fine tune the time distribution during the exam. The goal of a mock is to set realistic expectations for a score. To practice more and more questions is not the goal of a mock. You have books for that. Anywhere from 10 to 15 mocks is more than enough for most CAT aspirants. You should use the last two months of your preparation taking around 1 mock a week. Make sure that you analyze your mocks properly (this might consume more time that giving the actual mock), but you will identify your strengths and weaknesses and use the rest of the week to improve your test taking skills. You can start with practicing Official Paper CAT 2017, which was conducted on 26 November 2017, to get an idea about the paper pattern. With Data Interpretation and Logical Reasoning on the tougher side for CAT 2017, there was a major drop in scores. Practicing Official CAT 2017 DILR section will surely give you an idea about how to start your preparation for DILR section. Quantitative Aptitude and VARC were on the easier side. So, scoring well in Data Interpretation and Logical Reasoning would have been a game changer. Click here to go through CAT 2017 Exam Analysis. I hope you found this post useful. Do share it with your friends as well. Thanks for the great post. This will really help. Im in 5th sem b.Tech. Could you please tell what average amount of time should be allocated to the 3 phases?